adidas has a long history with Skechers. In 1994, adidas filed suit for trademark infringement over Skechers‘s Karl Kani footwear. The companies entered into a settlement agreement the following year (the “1995 Agreement,” attached below). Under this agreement, Skechers acknowledged that adidas is the exclusive owner of the THREE STRIPE DESIGN, agreed not to use the THREE STRIPE DESIGN or any mark confusingly similar thereto, and agreed to cease distribution of its KARL KANI sport shoe. 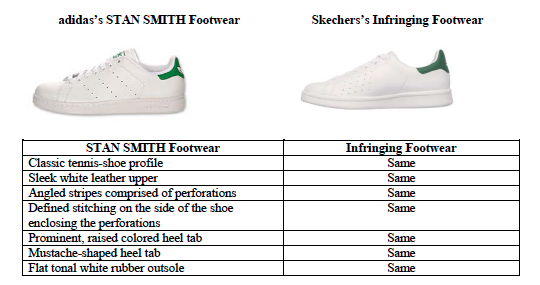 adidas is especially aggrieved about a shoe that is (allegedly) confusingly similar to their famous Stan Smith shoe and claims that Skechers intends their “Stan Smith Knock-Off” shoe to be confusingly similar to the adidas Trade Dress and offers evidence that the Skechers website included the terms “stan smith” and “adidas original” in the source code. adidas America Inc. et al v. Skechers USA Inc.
Adidas has filed a complaint alleging that clothing retailer, Forever 21, and clothing manufacturer/distributor, Central Mills, have been selling counterfeit adidas clothing. 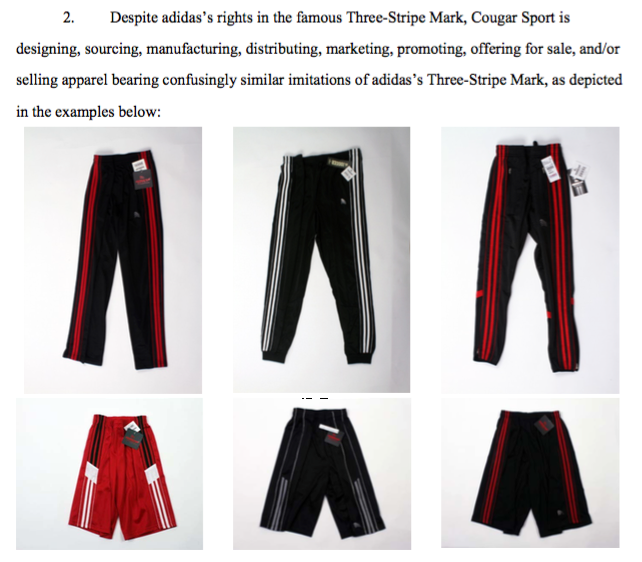 In the complaint, adidas alleges Defendants have been importing and selling “apparel bearing three stripes that constitute counterfeit and/or confusingly similar imitations of adidas’s Three-Stripe Mark,” and included pictures of two examples (see Complaint below). In 2013, Forever 21 and Central Mills were sued by fashion photograher, Mark Hunter, for copyright infringement. Hunter alleged that Defendants used one of his photographs on clothing without authorization. That case was settled out of court less than four months after the complaint was filed. Defendant: Forever 21 Inc., Central Mills Inc.
adidas America, Inc. et al v. Reliable Knitting Works, Inc. Defendant: Reliable Knitting Works, Inc. Does trademark protection of Adidas’ famous “Three-Stripe Mark” also extend to four stripes? Fashion designer Marc Jacobs is ready to debate that question in Oregon federal court. Here’s an interesting case…breach of a noncompete, trade secrets, trademark infringement, pesticides and even the EPA.